Downstream Strategies is an environmental consulting company in Morgantown, West Virginia, with program areas in environmental policy, environmental science, and geographic information systems. The company provides science, research, and tools to organizations, businesses, and agencies. It offers clients an alternative to mainstream environmental consulting by combining sound interdisciplinary skills with a core belief in the importance of protecting the environment and linking economic development with natural resource stewardship. This report is the first in a series of white papers Downstream Strategies plans to publish to try to help inform public policy decisions about energy and climate change, water quality and quantity, and other issues of importance to the state, region and nation. This particular paper was not funded by any particular client, grant or organization. The Decline of Central Appalachian Coal and the Need for Economic Diversification makes even more clear that the coal industry in Central Appalachia (defined as the coal-producing counties in Southern West Virginia, Eastern Kentucky, southwest Virginia, and eastern Tennessee) is already in big trouble — with or without more environmental restrictions. Coal mining has played an important role in local economic development in Central Appalachia, primarily due to the jobs and taxes that the industry has provided. In 2008, for instance, the coal industry employed 37,000 workers directly and indirectly across the region, accounting for 1% to 40% of the labor force in individual counties. Additionally, the coal severance tax generates hundreds of millions of dollars in state revenues across the region every year, with tens of millions of dollars being distributed to counties and municipalities. Despite these economic benefits, coal-producing counties in Central Appalachia continue to have some of the highest poverty and unemployment rates in the region, and due to the dependence on coal for economic development, any changes in coal production will have significant impacts on local economies. In particular, look first at that bump up in Central Appalachian coal production from 1993 to 1997. That’s the period where the initial requirements of the 1990 Clean Air Act are frequently cited as driving up demand for low-sulfur coal in this part of the country — and, perhaps ironically, environmental protection regulations helped bring about the increase in mountaintop removal during that period. But then look what happens after 1997. It’s consistently dropped, to about 235 million ton in 2008. And follow that red line until it turns into a dotted line … the drop — as projected by the U.S. Department of Energy, even absent any restrictions on greenhouse emissions — keeps going. DOE projects Central Appalachian coal production could be cut in half before the end of this decade. Let’s repeat that: Central Appalachian coal production could be cut in half before the end of this decade. And, again — that’s absent any climate change legislation or regulation. Why is production from this historically coal-rich region dropping, and why is it projected to continue to drop? Let’s start by going back to the Clean Air Act. While the early requirements of it benefited Central Appalachian coal, the second round of implementation dates has not. 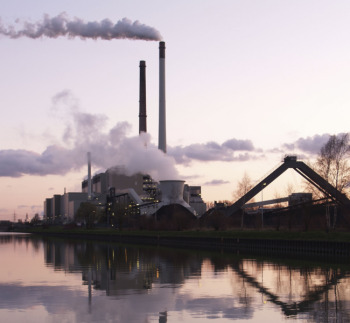 The first round required air pollution reductions from a smaller set of U.S. power plants, and many utilities chose to meet these by switching to lower-sulfur coal. A couple things happened as a result. 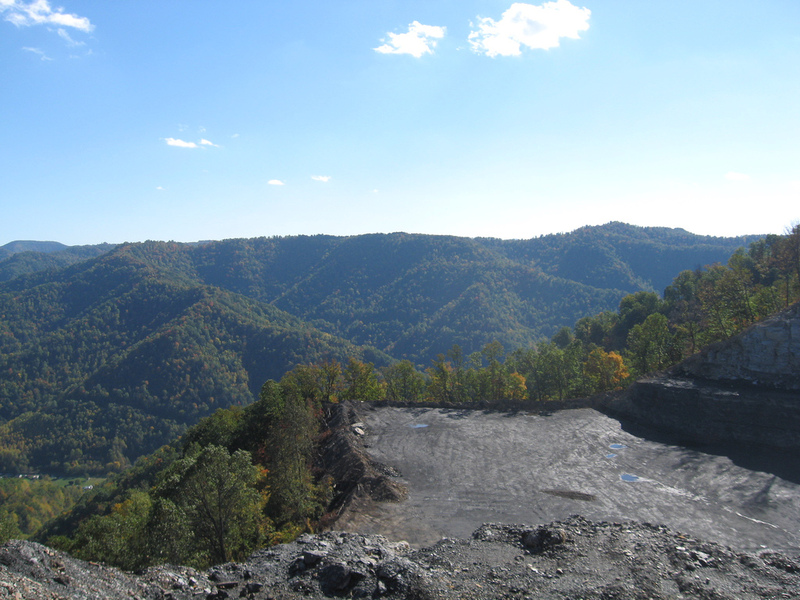 Operators put more resources into big mountaintop removal mines in Central Appalachia, to get at the low-sulfur coal there. The high-sulfur coalfields of Northern Appalachia and Illinois saw thousands of mining jobs disappear. And, of course, coal mining skyrocketed at the huge surface operations of Wyoming’s Powder River Basin. Since 1995, when the first phase of the CAA amendments took effect, another 4,523 MW of generating capacity have been equipped with FGD (approximately 2,600 MW after 2000)—nearly doubling the total scrubbing capacity. As of 2007, 35% of all coal-fired generators comprising nearly 50% of all coal-fired generating capacity in Pennsylvania were equipped with FGD (NETL, 2007). Aided by the new FGD installations at its coal-fired power plants, Pennsylvania’s annual consumption of Central Appalachian coal since 2000 has declined by approximately 9 million tons. Following an increase in both Central Appalachian and PRB coal through the 1990s, utilities in Ohio have since reduced their annual consumption of both Northern and Central Appalachian coal, by a total of nearly 14 million tons, while increasing their demand for PRB coal by an additional 9 million tons. 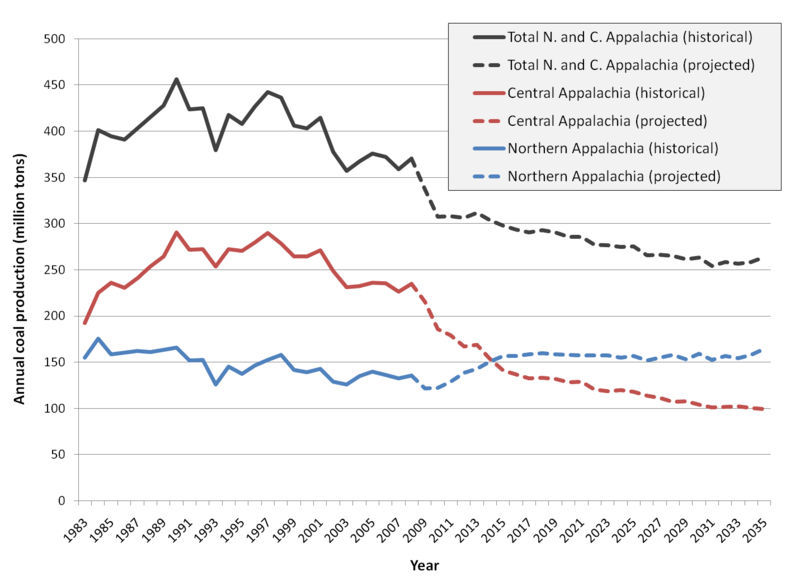 This marks a significant decline in the competitiveness of not only Central Appalachian coal, but Northern Appalachian coal as well, in relation to coal from the PRB. While this is happening, coal is also facing increased competition from natural gas and from alternative energy sources. Coal is facing an increasing challenge from natural gas as a preferred energy source. The discovery of new reserves has resulted in an over-supply of natural gas, which has reduced the cost of electricity generation from natural gas in relation to coal. In recent years, this has had a significant impact on the choice of fuel for new and existing generation. … Coal’s share of total electricity generation in the US declined by 2% between 2003 and 2008, even with a slight increase in absolute generation, while the share of natural gas increased by 5%, resulting from a 35% increase in generation. Planned capacity additions through 2012 are dominated by natural gas, totaling over 48,000 MW, or 52% of planned additions, while coal-fired power plants amount to around 23,000 MW, for 26% of the tota. Overall, recent trends and planned additions suggest that natural gas may take an increasingly greater share of electricity generation. 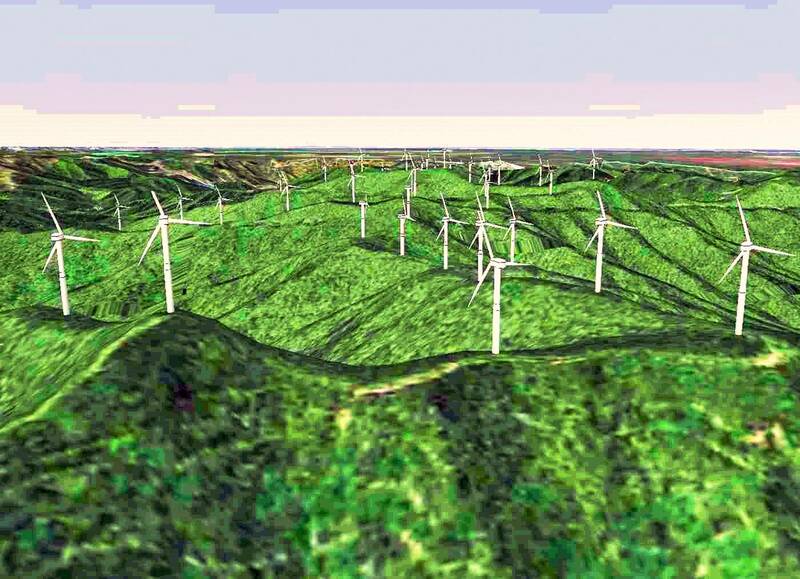 Renewable energy, while still more expensive than conventional fuels such as coal and natural gas for electricity generation, has also been slowly growing in the Appalachian region, although it has yet to have a substantial impact on the region’s generation portfolio. However, the financial assistance and incentives provided in the 2009 American Recovery and Reinvestment Act (ARRA) may help increase the pace of renewable energy development in the coming years. Pending climate legislation is also expected to spur new development of renewable energy as the country moves to reduce its carbon emissions. EIA projects under its reference case—which does not account for pending climate legislation—that the share of US electricity generation from renewable energy will grow from 8% in 2007 to 14% of total generation by 2030. Finally, there’s the depletion of the Central Appalachia’s best coal, which the report calls a “primary factor” that is making the region’s mining industry less competitive. The average mine mouth price of Central Appalachian coal — from both surface and underground mining — more than doubled between 2000 and 2008. The onset of this price increase corresponds exactly with the beginning of the decline in labor productivity. Click graphic to make it larger. 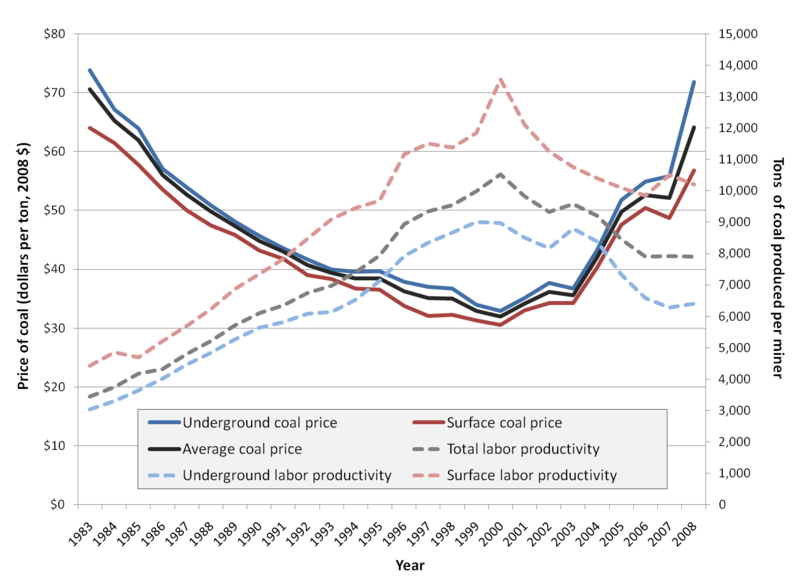 The cause-and-effect relationship between coal prices and labor productivity is difficult to assess. On the one hand, increases in coal prices allow operators to mine otherwise uneconomical coal reserves, which are thinner and more costly to extract. This could reduce labor productivity when prices are high. On the other hand, decreases in labor productivity would increase production costs and put upward pressure on prices. It is also possible that the decrease in labor productivity is both a cause and an effect of the increase in price. Labor productivity at Central Appalachian coal mines, on average, rose sharply through the 1990s. This was due to a shift in production to surface mines and drastic improvements in labor productivity for both underground and surface mines. The consequence of the improvements was a sharp reduction in coal mining employment, especially in underground mining. Since productivity peaked in 2000, however, employment has generally improved—not as a result of increased production, but rather as a result of the depletion of the best coal reserves. Labor productivity since then has declined by 25% and 30%, respectively, for surface and underground mining. This contributed to a doubling of coal prices between 2000 and 2008 as more workers were required to produce each ton of coal. The result was a reduced competitiveness of Central Appalachian coal, as illustrated by a sharp decline in demand, and therefore production. The trends observed since 2000 have occurred even though lower-cost methods of surface mining expanded in use, thus suggesting that future coal production in the region may be facing a significant challenge. Significantly, the continued shift to surface mining even after peak labor productivity in 2000 should have increased total labor productivity, because surface mining is the more labor-efficient method of coal production. … Labor productivity at both surface and underground mines—and therefore total labor productivity—has declined since then. The decline in total productivity suggests that the thickness and economic recoverability of the remaining coal reserves, whether mined by surface or underground methods, is declining. As labor productivity declines, production costs rise at mines, unless technology or transportation improvements offset the increased payroll. Each of these potential challenges will likely further reduce future coal production in the region beyond the reference levels predicted by [the Department of Energy]. As numerous counties within the region depend strongly on coal for their economic well-being, alternative options for economic development should be pursued in order to counter the negative impacts of any reductions in coal production. One other thing: It’s not like coalfield leaders couldn’t see this coming. Sufficient, high-quality, thick, bituminous resources remain in (major Appalachian) coal beds and coal zones to last for the next one to two decades at current production. After these beds are mined, given current economic and environmental restrictions, Appalachian basin coal production is expected to decline. Like the USGS report, the Hill and Associates study came out in 2001 … nearly a decade ago. And still, coalfield politicians aren’t telling their constituents about these challenges, or developing much — if anything — in the way of solutions. Well, unless you consider just complaining about the Obama administration’s “unilateral attack on the coal industry” coming up with a solution. 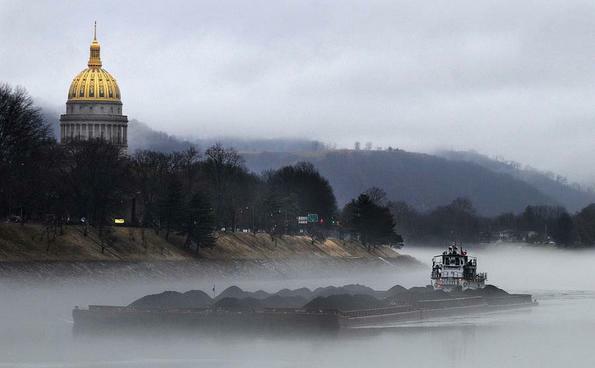 … State and local leaders and policy-makers should recognize the economic and regulatory realities facing the region’s coal industry, and should take steps to help diversify coalfield economies. Only by doing so will they ensure the availability of new jobs and sources of revenue for the impacted areas. 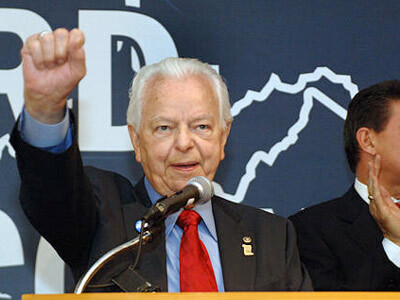 “West Virginians can choose to anticipate change and adapt to it, or resist and be overrun by it. The time has arrived for the people of the Mountain State to think long and hard about which course they want to choose.” The same is true for all of Central Appalachia. The EIA has certainly done a detailed analysis and projection. Like any economic projection such as for the stock market, interest rates, GDP, etc., there are countless opinions and those opinions change each year. You have used EIA’s reference case but they also project various other scenarios because they realize that the error factor in their projections is quite large. Tricky stuff. Looking at the graphs from the 2008 EIA data you can see that “Appalachian coal production declines slightly in the reference case”. Also in Figure 96 coal prices could substantially increase. If these projections are in constant dollars then the actual increases could be considerably higher after compounding inflation. We’ll know what happens after it happens. But like I said, I certainly support economic diversification for WV, especially with high value added enterprises. When the state is ranked 49th or 50th by Forbes as a desirable place to do business, politicians need to address this if they’re serious about diversification. Another big huddle is infrastructure development in a state with only 3% flat ground. I wonder how that can be addressed. Clem, you stated “Either way, your scenario of a not-quite-so-bad decline in the coal economy would be dwarfed by the economic turmoil that occurs to the rest of the economy by dramatically rising energy costs”. You are right on. Big energy price increases will wreck havoc. Just look at the energy prices in places like California that doesn’t have coal generation. What do you think their electric prices will do as they greatly increase their percentage by alternative sources? What kind of disasters will occur without steady base load generation as supplied by coal and nuclear? As the huge masses of population in India and China move toward middle class there will be huge demand for commodities. Couple the recovery of limited resources with anti-mining advocates (not to mention runaway Federal government expansion) and huge price increases may occur. People moved into these hills in the first place because land was cheap, they could be sustained on a small farm, and they did not want to live too close to neighbors. First it was the timber companies that moved off the first settlers; then itwas the coal companies that took over. With timber companies and coal companies gone, there is much less to offer settlers. One cannot find what can be called cheap land, small sustainable farms do not fit our society. There are still those who do not want to live close to neighbors, and they, when they have independent sources of income, can pick West Virginia. Otherwise, just plan for the youth to continue to leave the state. Plan for it to return to a natural state, whatever that becomes. It will be pretty. Even the strip mines in time will reforest. If you want to make a fortune, pick somewhere other than West Virginia. Rory, If you look on CONSOL’s web site under the news releases on 6-18-07. The CEO of our company clearly states that “when combined with the reserves to the north, we will have created a reserve block of nearly 300 million tons of surface and underground mineable coal consisting of thick seams more typical of a earlier generation of mining in Central Appalachia” Hows that for pithy Ken? In response to eastwood78’s question about 10 inches above: No, the wind farms would not “take over” the cost for UMWA retirees’ and widows health care and pensions. The money for that c0mes from contributions made by the companies that are currently mining coal. Without getting too deep in the weeds about the funding for those benefits, those companies are required either through our collective bargaining agreements or by law to make those contributions. If there are no companies mining coal who are either organized by the UMWA or required by law to contribute on behalf of retirees who have enough eligible UMWA service, then there are no contributions going into those funds. Scott 14: That is more believable than saying the the Fola coal mine, by itself, has the potential for the mining of 300 million tons of coal, by a single surface mine. I don’t doubt that Consol holds 300 million tons of coal, mineable by either method, and lying within different parts of the state. Casey, and readers: Let’s look at the whole statement that Casey references from the 2008 Annual Energy Outlook. “Appalachia” as defined there includes Northern, Central, and Southern Appalachia, combined. So in total, that AEO 2008 report still says that Appalachian coal production is expected to decline. The past/future production chart as shown in Ken’s blog shows an increase in Northern App production but a greater decrease in Central App production (southern App production, while not negligible, is quite small in comparison). And the second part of that quote supports everything we’re saying in our report: The best and lowest-cost coal in Central Appalachia is nearly mined out, and future production will be costlier and therefore less competitive. Projections and predictions about coal and other fossil fuels are interesting and entertaining, but there are so many known-unknowns and unknown-unknowns that not much can be done with them. Largely owing to shale gas discoveries, estimated reserves of natural gas in the United States in 2008 were 35 percent higher than in 2006. Further, because of shale gas production, net imports of natural gas are more than 30 percent lower and domestic production of natural gas is 12 percent higher for the first 9 months of 2009 than they were during the same period of 2007. Shale gas has made up for declining pipeline imports of natural gas from Canada and slower than expected increases of liquefied natural gas, some of which is being diverted from U.S. markets to China. Expectations are that production of shale gas will make the U.S. the world’s largest producer of natural gas, overtaking Russia, whose demand plunged as a result of its economic decline. Also: Remember that mining itself consumes a lot of oil and electricity; even the explosive agent ANFO is 20% diesel fuel. Once approved by the Commonwealth of Pennsylvania, N-Viro intends to be in production of the N-Viro Fuel(TM) product and conduct other scheduled test burn demonstrations. These tests will require the utilization of local supplies of biosolids from municipal wastewater treatment facilities. The Company expects to receive permit approval and begin production during the first half of this year. The portable pilot facility will be capable of demonstrating a full-scale production of N-Viro Fuel(TM). The Company expects to make use of this pilot for several tests burn applications where N- Viro Fuel(TM) can be blended with coal, waste coal and even biomass types of fuel. Additionally, this plant will further validate the N- Viro Fuel(TM) technology and provide valuable analytical data for future and developing projects. Rory, I don’t think Scott14 is talking about other parts of the state and he never said Fola would surface mine all of it. Consol bought Fola for several reasons but one is access to their extensive adjoining underground reserves. The resultant block of coal is huge and potentially shipped through the existing loadout. I can see how I’d misinterpreted that as being part of the same operation. In the Coal River Valley, though, Massey’s subsidiaries often have the same name when they’re mining in the same general area. I still also question whether or not the 300 million tons will be marketable, but I have no solid evidence for saying it won’t. I don’t have the patience to sit here and read every comment left thus far, and i actually only skimmed the article those comments are referring to. I just want to point out some things that conflicted in the report. One of the main topics seems to regard the decline in coal production in recent years. It forgets to consider that maybe some of this decline was due to stricter regulations. Yes, the regulations need to take place. I am an advocate for safer, cleaner, and more environmentally friendly coal mining and power generation, but for some reason environmental advocates have declared this impossible. Give coal mining a chance. Companies have made great strides towards efficiency and environmentally friendly coal mining and power production in recent years, but even after this co-operation, environmental groups are telling them to throw in the towel. Problem is, the people saying throw in the towel don’t see how their lives will be effected. How about we start running this county more akin to communist Russia. One week a month we will shut their power off. This will cut down on emissions too, but they would have to sacrifice right along with the rest of us. How about instead of the government shutting down the power for you, you stop it yourselves. Everyone against coal mining shut the power off at your home for a week. I’m not saying shut the lights off. I’m saying go to your breaker box, find the big breaker at the top and flip it. Everything in your house goes dark. If so much of the country is behind it, it will greatly impact the emissions, and need for coal in our country. Step up. Do it. Quit being a talking head. Lead by example. You using power is like a vegan eating meat. You hate the damage caused by coal mining, but you require it every time you flip the switch. You raise your voice in the name of the environment, but slowly help destroy it with a majority of your daily activities. Ryan, that’s a specious argument. Conservation and efficiency are, of course, critical to any energy policy, and everyone should be doing it. Whether or not you’re a “treehugger,” it saves money. But saying that anyone who wants smarter energy policy and a sustainable future for Appalachia has to stop using all energy is ridiculous. First of all, some of us are lucky enough to have green energy options. Second of all, that argument is like saying, “If you want safer highways, you have to stop driving your car, because someone could hit you!” It’s an attempt to derail the real discussion, and I’m so tired of hearing it. Thank you for your insightful posts and tempered response, however, I still can’t get your numbers when I do the severance calculation. I tried to email my numbers to you, but might have messed up. When I take the 47 million tons in question times the $51.21/ton weighted average selling price I get total revenue of $2.4 billion dollars. 5% severance tax yields $120.6 million dollars. The county production portion 5.25% (75% of 7%)of this number gives $6.3 million. The population portion is harder to calculate, but since Raleigh County is one of the largest counties it should be at least 1.75% or another $2.1 million dollars for a total of $8.4 million over the 17 year mine life for an average of right at $500,000/year. This number seems about right intuitively since my handy coal fact book says that in 2008, Raleigh County produced a little more than 10 million tons and received a little more than $2 million in severance tax. If I am wrong, please let me know what the error is. I know this issue probably doesn’t mean anything to anyone other than me, but I am curious to know if I screwed up. Thanks in advance for your help. Blue Canary, I think Ryan didn’t mean “all” energy,just energy produced by coal. You are “lucky” enough as you say to have the green option,just be sure to use it. I just skimmed your calculation and something does indeed seem wrong, but I’ll give it a harder look first chance I get. Try and emailing me again and we can discuss it that way and then re-post our collective findings once we figure this out. Matt, I have a spreadsheet all ready to go for you with the full severance tax analysis. I’ll summarize the calculation for other readers, but if you’d like the actual spreadsheet send me an email. The $36,000 tax receipt calculation for Raleigh County’s share of severance taxes from MTR on Coal River Mountain is correct though, based on the price used in the report (I used a slightly higher price in my own calculation, resulting in a tax receipt of just under $38,000). Total Raleigh County sev tax receipts, 2008: $2.29 million. That is slightly higher than the $36,000 provided in the Coal River Mtn Wind vs MTR econ report, but that’s because I used a higher price as provided by the EIA, whereas the report used the average WV price for steam coal provided by the WV Tax Dept ($46.98), as well as a slightly different methodology. Ah, Matt, I see what was wrong with your calculation. You didn’t take out the state’s 93% from the $120.6 million before calculating the county share. In other words, you didn’t apply the 7% county share to the $120.6 million before calculating Raleigh County’s share. Your calculation, then, assumes that counties receive the full $120.6 million of the 5% of total revenues. I hope that clears up the concern. Thank you for responding, but this does not fit my understanding of the severance tax collection. 5.25% of the 7% county share is supposed to go back to the county of origin. My calculation of this may be off but only to the extent that the coal river mountain sales price differs from average selling price across the state – could probably be +/-10% but that would be it. I believe the difference is that you are saying that since Raleigh co. gets 7% of all county severance tax this year that every new ton will also result in 7% of total. I believe this is incorrect. I read your link, but didn’t see any calculations that I could use, but I will recheck. If 2.8 million tons only generates 36k for Raleigh Co., how did 10 million tons in 2008 generate $2 million? I know this is not a big point either way, I am just trying to figure it out. That’s not how that works. You take the 5.25% of the 7% county share, and you distribute that to all coal-producing counties according to how much they produced in relation to the total. This is how Raleigh County received $2 million. That $2 million was not how much severance tax the production from the county generated. That $2 million is a relative distribution, based on how severance taxes are distributed. So looking at it again. 10 million tons multiplied by an arbitrary, say, $50, equals $500 million in total revenue. The total severance tax collection of 5% would be $25 million. Of that, the state keeps 93%, or $23.25 million, leaving $1.75 million to be distributed to counties. For the county distribution, 75% of that $1.75 million(or the 5.25% of the 7%) is distributed among all coal-producing counties in the state — not only to Raleigh County. That amounts to $1.3 million. Now, if Raleigh produced that 10 million tons of a total of say 150 million tons for all of WV, then Raleigh would receive 1/15th of that $1.3 million, or $87,500. If Raleigh has say 5% of the state population (which is about accurate), they would get roughly 5% of the remaining 25% of the 7%. That remaining 25% of the 7% county share amounts to approximately $450K. Raleigh’s share, 5%, would be $22500. So, the total amount of severance tax Raleigh County would get directly related to the mining and sale of the 10 million tons produced within the county is $110,000. That’s how the severance tax works. The reason Raleigh gets $2 million (at a higher price than the arbitrary $50 example used here) is because of all the other coal produced and sold in the state, and therefore taxed. Multiply the $110K by 15 (in order to scale up to Raleigh share of severance tax for the full 150 million tons) and you get I think $1.65 million. Scale down to the projected annual coal production from MTR on CRM (2.8 million tons)–and do this by taking the $110K Raleigh share from the 10 million tons example and multiply by 0.28–and you get a Raleigh-share of severance taxes generated by MTR on Coal River Mountain of $30,800 annually. That’s how the severance tax collection and distribution works. Of course, ramp up the price a bit to the prices we’ve used in previous calculations, like in the CRM report, and you’ll get $36K or so. Lemme know if this makes sense. I’ll keep checking the blog, or you can email me. Take care man. Whenever you are talking about these large coal companies, or any large company in the U.S., you have to start looking at the smaller picture instead of the big picture. This large, sometimes greedy company would not function without the work of smaller groups of hard working people. My grandfather was a coal miner, as was my father, and my husband supports myself and my son by working for the same company now. The company that my husband works for is one of the “clean coal” companies and has adjusted their workings accordingly to jurisdiction and changes in the environment. I DO NOT agree with how some companies may mine and work for their coal, but I DO AGREE with these men and sometime women who work 10-15 hour days just to support their families in this area. I do not know how many of you are from “coal country” or who have ever visted, but it is quite a rural area. (Not to say that the people are any less intelligent than any other area in the U.S.) We are dependant on natural resources and they support our families, children, schools, and so on. I believe that with the technology and knowledge that we have all been so greatly blessed with in this world, their is a way to save jobs and fellow American citizens from going under because of effects to the environement. Yes, “green” technology is now out there, but in a small, rural area such as the one that I live in, it is virtually impossible to afford. I think that the green resources should not be the expensive alternative for families and companies to turn to, but rather the affordable and more available to obtain. If you want a change, you have to be able to provide a way for people to do so that is feasible. When this happens, if the changes are not made, then there is a time for much bigger changes to be made. But coming from a student who was fortunate to live a very comfortable life in such a small area do to the job that my father had in the coal industry, I do not know what I would have done if my dad would have lost his job due to the situation that has come about, and even though my husband works for a company that is in the clean coal bracket I am afraid that he is going to lose his job. It makes me worry for my 3 year old son as well as myself and my husband. I think that it is important for everyone to take a step out of their box and take a walk in my family’s shoes. If you were a small child, and your family lost everything because of environmental issues, what would you do? Is it really worth all the lost jobs and worth the devastation to the income of so many? Yes, I think that it is most definitely a time for change and that these companies that are causing so much damage to our environment need to clean up their act, but people have to be able to afford the “green option” or be able to have access to the “green option” before they can make that change.